* Also available is a private double room / en suite (sleeps 2 adults) - the nightly rate is $ 130 per double including breakfast. 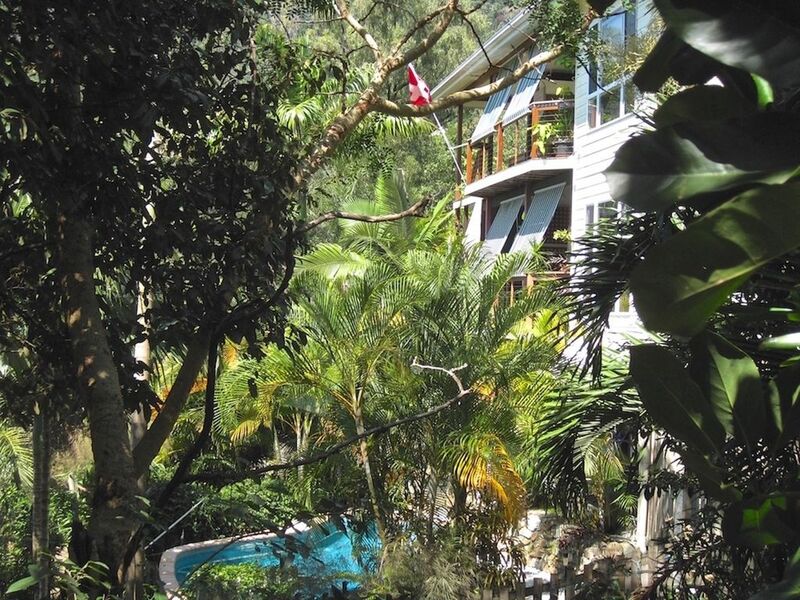 Parkwood B&B is located in the hills behind Cannonvale / Airlie Beach overlooking Marina and Coral Sea - only 3km from the centre of Airlie Beach. Looking at the Whitsundays' cliffs and steep hillsides, it's not difficult to imagine them as the tips of a drowned mountain range. The many islands are the remains of a coastal range which was submerged when the sea level rose at the end of the last Ice Age. These peaks form the largest offshore island chain on the east coast of Australia. For the visitors it means island dream holidays. Recreational opportunities are numerous with beautiful sandy beaches. extensive fringing reef and magnificent scenery. And The Great Barrier Reef - a bit more outside - is one of the most beautiful gift Australia offers to the world. Apartment and Double room have both both an en-suite. What a lovely find! Lush, tropical gardens with pathways to explore. The verandah is very comfortable with a daybed and provides a beautiful view. The family enjoyed the pool. Breakfast was a great! We had a fantastic stay! My daughter loved 'exploring' the garden. Delicious continental style breakfast. Lovely couple and very knowledgeable about the area. We'd be very happy to stay there again. We traveled to Australia to see our daughter graduate from college in Sydney. We crammed a lot of trip into seventeen days. including 12 flights, too and from different locations. Our stay with George and Ursula was definitely one of the most enjoyable, and memorable, stays on our vacation. You will not meet a more warm and gracious host, anywhere. The porch view is very scenic with views of the edge of the rainforest, with a beautiful backdrop of the Coral Sea. Breakfast was available each morning, with fresh fruits and baked goods, juices and hot coffee. Beautiful parrots and cockatoos flying about. My bucket list included a private fishing trip on the great barrier reef, which was awesome. We also wanted to see kangaroos in their habitat, this we accomplished by a drive to Dingo Beach. I would highly recommend staying at Parkwood B&B, to everyone. Photos do not do justice to this incredible B&B. Location, view, decor, breakfast and most of all George and Ursula the owners! You have a wonderful view of the ocean over a jungle like canopy. Beautiful birds and wildlife surround you. Ursula and George greet you as you pull into their driveway. Any sightseeing assistance needed can be provided by Ursula and she is happy to assist you with reservations. Breakfast was delicious and plentiful every morning. We spent 3 wonderful days and wish it would have been longer. Can 100% recommend this location. You leave feeling you have made 2 new friends - you could not have better people to make you feel welcome. Thank you George and Ursula! Ursula is a wonderful host, B&B was 5 star. We had an amazing stay. Lovely views and a gorgeous garden. I had a marvelous stay in Parkwood B&B Airlie Beach. George & Ursula is a very lovely and helpful couple. The room we stayed own the wonderful interiors, bed is comfortable (I have a quality of sleep), both room and bathroom very clean, most of the amenities are provided too. Breakfast served is excellent and healthy. I enjoy the pool which can freely use it anytime. I was impressed with all the environment and facilities provided. It's exceeded my expectation (Just love it). Price is very reasonably as to me is a luxury stay. I will return one day not only that I missed the place but the couple, George & Ursula too.